Available for Sale, Rent or Lease Purchase. Cannot be transported on a chassis. 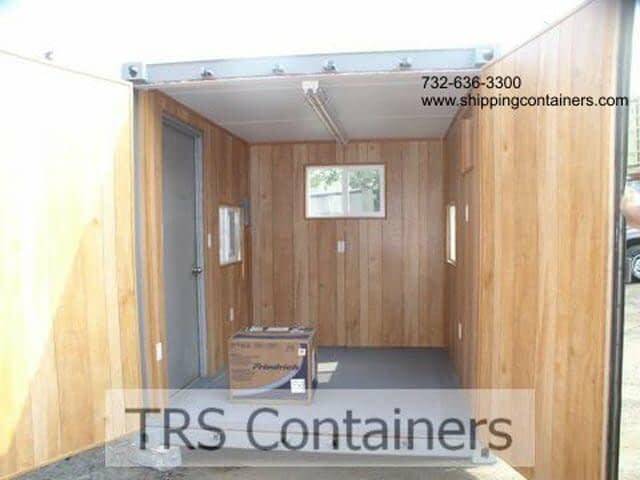 TRS converts New and Used 10ft long steel shipping containers into customized modular structures. There are no limits, but your imagination. 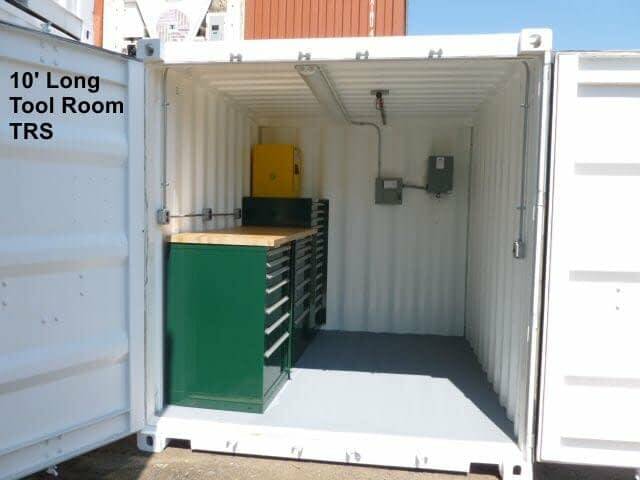 Pictured here are containers that were fabricated to 10ft long and then upgraded to function as offices, explosion proof guard shacks, mobile environmental testing centers, rather than dry storage space. Our experience in intricate metal fabrication is used daily in the permanent and temporary enclosures we build. With our team of electricians, carpenters, plumbers and expert metalworkers TRS can offer a turnkey solution to any fabrication project. All photos depict the finished products for work executed at our facility. We do not hire outside fabricators to customize our client’s projects. There are no middlemen hence no confusion. Neither new or used 10ft long containers coordinate with any ISO chassis. They must be transported on a flatbed or stepdeck trailer. 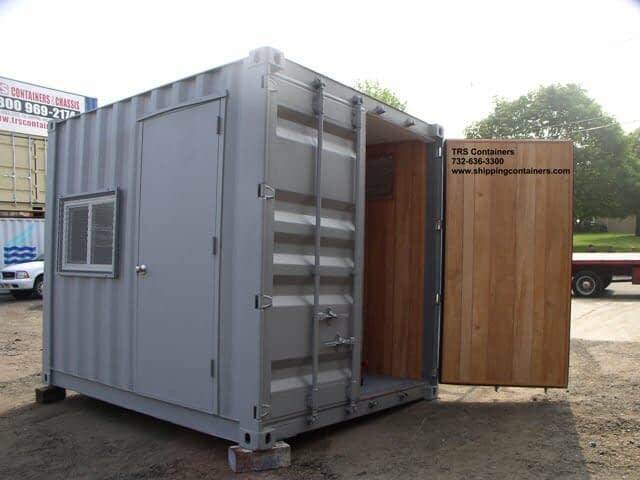 As a temporary project solution, containers are durable and easy to transport from one event or jobsite to another. Can be outfitted with security features: lockboxes on doors, cages for hvac units, bars on windows. 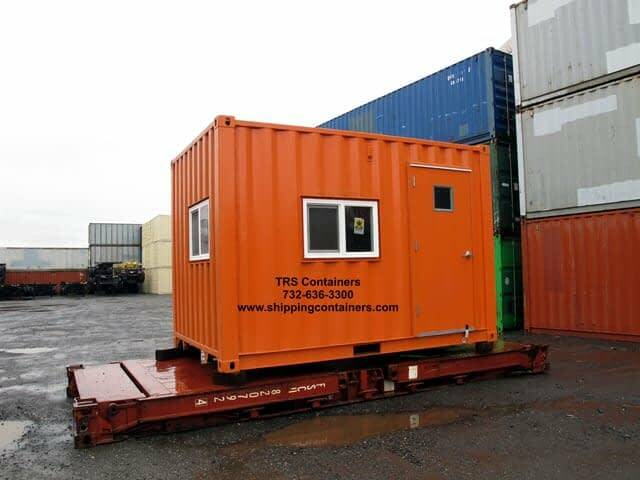 Decommissioned shipping containers are an environmentally and economically friendly alternative to costly brick and mortar construction. Lightweight they are manageable to stack or move at a construction site or military theater. Their ground level feature offers safety and convenience. 1.25 inch marine plywood floors treated to resist bugs and rodents. Ashtray vents for air flow prevents condensation. Factory blasted, primed and painted with marine grade paint systems for durability. Lashing rings for securing material during transit. Non-corrosive Corten 14 gauge steel construction. Safe ground level access so no slippery stairs. 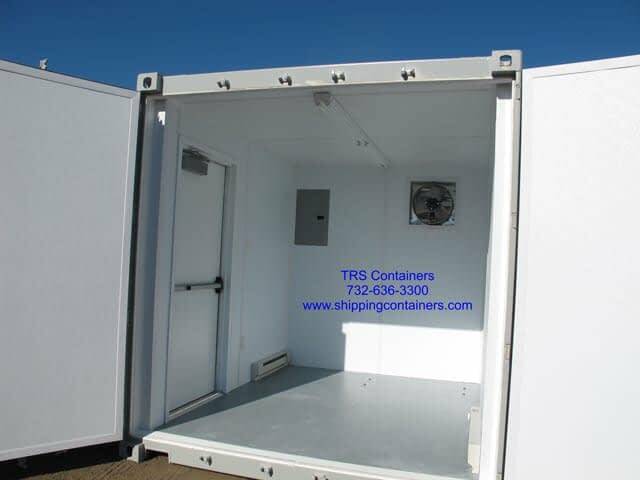 Standard sizing allows for transport by truck, rail, ship or air. Vandal proof steel locking bar system on doors. Watertight with heavy rubber gaskets around doors. 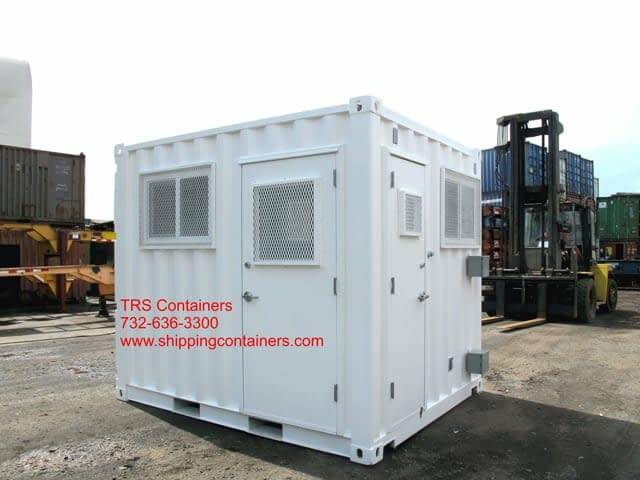 Used 10ft containers are customized so you have the option on how to close the opening. Casters for repositioning inside a building. Custom flooring: vinyl tile, diamond plate, skid proof painting. Electrical Package with lights, switch, panel box, outlets, hvac, baseboard heating. Frame, Insulate and Panel; many options. Personal Doors with locking hardware. Plan Tables, Shelving, file cabinets, Stanley Vidmar tool cabinets. Shelving installed: wood or metal. Windows with Security Bars and skylights.